ALL are welcome to experience “Adventure Anchored in Christ.” Voyageurs welcomes campers of all ages with developmental and/or physical disabilities. Each camp experience is made accessible to all including waterfront adventures, games, worship, and Bible study. 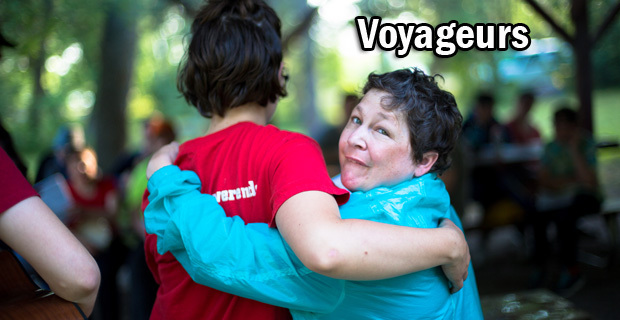 Compassionate and sensitive camp staff eagerly await opportunities to build relationships with Voyageur campers. An on-site RN ensures that medical needs are safely addressed. Call 701-263-4788 or email registrar@metigosheministries.com for a Voyageurs registration form. We invite you to send campers, age 11 to age 25, to Voyageurs I. We will adapt programming for this younger group of campers. The week is NOT, however, exclusive to this age group. **Please note that all Voyageurs weeks are Monday through Thursday. Agencies may arrange for a Thursday pick up at 1:30 pm.